For other persons named Benjamin Harrison, see Benjamin Harrison (disambiguation). 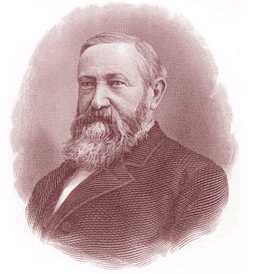 Benjamin Harrison (August 20, 1833 – March 13, 1901) was the 23rd President of the United States, serving one term from 1889 to 1893. Harrison was born in North Bend, Ohio, and at age 21 moved to Indianapolis, Indiana, where he became a prominent state politician. During the American Civil War Harrison served as a Brigadier General in the XXI Corps of the Army of the Cumberland. After the war he unsuccessfully ran for the governorship of Indiana, but was later elected to the U.S. Senate from that state. Harrison, a Republican, was elected to the presidency in 1888, defeating the Democratic incumbent, Grover Cleveland. He was the first and only president from the state of Indiana. His presidential administration is best known for its economic legislation, including the McKinley Tariff and the Sherman Antitrust Act, and for annual federal spending that reached one billion dollars for the first time. Democrats attacked the "Billion Dollar Congress", and used the issue, along with the growing unpopularity of the high tariff, to defeat the Republicans, both in the 1890 mid-term elections and in Harrison's bid for re-election in 1892. After failing to win reelection he returned to private life at his home in Indianapolis where he remarried, wrote a book, and later represented the Republic of Venezuela in an international case against the United Kingdom of Great Britain and Ireland. In 1900 he traveled to Europe as part of the case and, after a brief stay, returned to Indianapolis where he died the following year from complications arising from influenza. The Harrisons were among the First Families of Virginia, with their presence in the New World dating back to the arrival of an Englishman, named Benjamin Harrison, at Jamestown, Virginia in 1630. The future president Benjamin was born on August 20, 1833, in North Bend, Hamilton County, Ohio, as the second of eight children of John Scott Harrison (later a U.S. Congressman from Ohio) and Elizabeth Ramsey Irwin. Benjamin was a grandson of President William Henry Harrison and great-grandson of revolutionary leader and former Virginia governor Benjamin Harrison V. Harrison was seven years old when his grandfather was elected President, but he did not attend the inauguration. Although Harrison's family was old and distinguished, he did not grow up in a wealthy household, as most of John Scott Harrison's farm income was expended on his children's education. Despite the meager income, Harrison's boyhood was enjoyable, with much of it spent outdoors fishing or hunting. Harrison's early schooling took place in a one-room schoolhouse near his home, but he was later provided with a tutor to help him with college preparatory studies. Harrison and his brother, Irwin, enrolled in Farmer's College near Cincinnati, Ohio in 1847. Harrison attended the college for two years. In 1850, he transferred to Miami University in Oxford, Ohio, where he was a member of the fraternity Phi Delta Theta and graduated in 1852. Harrison attended Miami University with John Alexander Anderson, who would become a six term congressman, and Whitelaw Reid, who would be Harrison's vice presidential candidate in his reelection campaign. While attending Miami University, was greatly influenced by one his professors, Robert Hamilton Bishop, who instructed him in history and political economy. At Miami, Harrison joined a Presbyterian church and, like his mother, he would remain a member for the rest his life. After completing college Harrison took up the study of law in the Cincinnati law office of Storer & Gwynne, but before completing his law studies he returned to Oxford to marry. While at Farmer's College, Harrison met Caroline Lavinia Scott, the daughter of the University's president, John W. Scott, a Presbyterian minister. On October 20, 1853, they married in Oxford, Ohio, with Caroline's father performing the ceremony. The Harrisons had two children, Russell Benjamin Harrison (August 12, 1854 – December 13, 1936) and Mary "Mamie" Scott Harrison McKee (April 3, 1858 – October 28, 1930). After his marriage in 1853, Harrison returned to live on his father's farm where he finished his law studies. In the same year, he inherited $800 after the death of an aunt, using the money to move to Indianapolis, Indiana in 1854. He was admitted to the bar there and began practicing law in the office of John H. Ray. The same year he became a crier for the Federal Court in Indianapolis, making $2.50 per day. He was responsible for passing through the streets and declaring announcements from the court. While in Indianapolis, Benjamin Harrison was both the first President of the University Club, a private gentlemen's club, and the first President of the Phi Delta Theta Alumni Club of Indianapolis, the fraternity's first such club. Both clubs were still in existence in 2008. Harrison grew up in a Whig household and was himself a supporter of Whig politics in his early life. He joined the Republican Party shortly after its formation in 1856 and that year campaigned on behalf of the Republican presidential candidate John C. Frémont. He won election to become Indianapolis City Attorney in the same election, a position that paid an annual salary of $400. In 1858 Harrison entered into a law partnership, opening an office as Wallace & Harrison. Harrison was the Republican candidate for the position of reporter of the Indiana Supreme Court in 1860, his first foray into politics. Although this office was not political, he was an active supporter of his party's platform. During the election he debated Thomas Hendricks, the Democratic candidate for governor and future Vice President of the United States, on behalf of the Republican Party. After his law partner William Wallace was elected county clerk in 1860, Harrison opened a new firm with William Fishback, named Fishback & Harrison, where he worked until his entry into the army. At the outbreak of the Civil War, Harrison wished to join the Union Army, but initially resisted, as he was concerned that his young family would need his financial support. In 1862, President Abraham Lincoln issued a call for more recruits. While visiting Governor Oliver Morton, Harrison found him distressed over the shortage of men answering the latest call. Harrison told the governor, "If I can be of any service, I will go". Morton then asked Harrison if he could help to recruit a regiment, though he would not ask him to serve. Harrison proceeded to raise a regiment, recruiting throughout northern Indiana. Morton offered its command to Harrison, but he declined because of his lack of military experience, and instead was commissioned as a Second Lieutenant. In August 1862, when the regiment left Indiana to join the Union Army at Louisville, Kentucky, Harrison was promoted by Morton to the rank of Colonel, and his regiment was commissioned as the 70th Regiment Indiana Volunteer Infantry. The 70th Indiana first saw action in the Battle of Perryville, but spent most of the next two years performing reconnaissance duty and guarding railroads in Kentucky and Tennessee. In 1864, Harrison and his regiment joined William T. Sherman's Atlanta Campaign and moved to the front lines. On January 2, 1864, Harrison was promoted to command the 1st Brigade of the 1st Division of the XXI Army Corps. He commanded the brigade at the Battles of Resaca, Cassville, New Hope Church, Lost Mountain, Kennesaw Mountain, Marietta, Peachtree Creek and Atlanta. Harrison was later transferred to the Army of the Cumberland and participated in the Battle of Nashville. On March 22, 1865, Harrison earned his final promotion, to the rank of Brigadier General, and marched in the Grand Review in Washington, D.C. before mustering out of the army on June 8, 1865. While serving in the army in October 1864, Harrison was reelected reporter of the Supreme Court of Indiana and served four more years. The position was not politically powerful, but did afford Harrison a steady income. Harrison's public profile was raised when President Grant appointed him to represent the federal government in a civil claim brought by Lambdin P. Milligan, whose wartime conviction for treason had been reversed by the Supreme Court. Due to Harrison's advocacy, the damages awarded against the government were minimal. Local Republicans urged Harrison to run for Congress, but he initially confined his political activities to speaking on behalf of other Republican candidates, a task for which he received high praises from his colleagues. In 1872, Harrison entered the race for the Republican nomination for governor of Indiana. He was unable to get the support of former Governor Oliver Morton, who favored his opponent, Thomas M. Browne, and ultimately Harrison lost his bid for statewide office. Harrison returned to his law practice where, despite the Panic of 1873, he was financially successful enough to build a grand new home in Indianapolis in 1874. He continued to make speeches on behalf of Republican candidates and policies. In 1876 Harrison did not initially seek his party's nomination for governor, but when the original nominee dropped out of the race, Harrison accepted the Republicans' invitation to take his place on the ticket. His campaign was based strongly on economic policy, and he was in favor of deflating the national currency. His policies proved popular with his base, but he was ultimately defeated by a plurality to James D. Williams, losing by 5,084 votes out of a total 434,457 cast. Harrison remained a prominent Republican in Indiana following his defeat, and when the Great Railroad Strike of 1877 reached Indianapolis, he helped to mediate between the workers and management and to preserve public order. When Senator Morton died in 1878, the Republicans nominated Harrison to run for the seat, but the party failed to gain a majority in the state legislature, and the Democratic majority elected Daniel W. Voorhees instead. President Hayes appointed Harrison to the Mississippi River Commission in 1879, which was founded to facilitate internal improvements on that river. He was a delegate at the 1880 Republican National Convention the following year. After Harrison led the Republican delegation to the National Convention, he was again mentioned as a possible Senate candidate. He gave speeches in favor of Garfield in Indiana and New York, further raising his profile in the party. When the Republicans retook the state legislature, Harrison's election to the Senate was threatened by his intra-party rival Judge Walter Q. Gresham, but the contest was decided in favor of Harrison. After President James Garfield's victory in 1880, Harrison was offered a cabinet position, but he declined in order to begin his term as senator. Harrison served in the Senate from March 4, 1881, to March 4, 1887. He was chairman of the U.S. Senate Committee on Transportation Routes to the Seaboard (47th Congress) and U.S. Senate Committee on Territories (48th and 49th Congresses). The major issue confronting Senator Harrison in 1881 was the budget surplus. Democrats wished to reduce the tariff, thus limiting the amount of money the government took in; Republicans instead wished to spend the money on internal improvements and pensions for Civil War veterans. Harrison took his party's side and advocated for generous pensions for veterans and their widows. Harrison also supported, unsuccessfully, aid for education of Southerners, especially the children of the slaves freed in the Civil War, believing that education was necessary to make the white and black populations truly equal in political and economic power. Harrison differed from his party in opposing the Chinese Exclusion Act of 1882, believing that it violated existing treaties with China. In 1884, Harrison and Gresham again opposed each other, this time for influence at the 1884 Republican National Convention. The delegation ended up supporting James G. Blaine, the eventual nominee. In the Senate, Harrison achieved passage of his Dependent Pension Bill only to see it vetoed by President Grover Cleveland. His efforts to further the admission of new western states were stymied by Democrats, who feared that the new states would elect Republicans to Congress. In 1885, the Democrats redistricted the Indiana state legislature, which resulted in an increased Democratic majority in 1886, despite an overall Republican majority statewide. Harrison was defeated in his bid for reelection, the result being determined against him after a deadlock in the state senate, with the legislature eventually choosing Democrat David Turpie. Harrison returned to Indianapolis and his law practice, but stayed active in state and national politics. Results of the 1888 election, with states won by Harrison in red, and those won by Cleveland in blue. The initial favorite for the Republican nomination was the previous nominee, James G. Blaine of Maine. After Blaine wrote several letters denying any interest in the nomination, his supporters divided among other candidates, with John Sherman of Ohio as the leader among them. Others, including Chauncey Depew of New York, Russell Alger of Michigan, and Harrison's old nemesis Walter Q. Gresham, now a federal appellate court judge in Chicago, also sought the delegates' support at the 1888 Republican National Convention. Blaine did not choose any of the candidates as a successor, so none entered the convention with a majority of the Blaine supporters. Harrison placed fourth on the first ballot, with Sherman in the lead, and the next few ballots showed little change. The Blaine supporters shifted their support around among the candidates they found acceptable, and when they shifted to Harrison, they found a candidate who could attract the votes of many delegates. He was nominated on the eighth ballot by 544 to 108 votes, winning the Republican presidential nomination. Levi P. Morton of New York was chosen as his running mate. Harrison's opponent in the general election was incumbent President Grover Cleveland. He ran a front-porch campaign, typical of the era, in which the candidate does not campaign but only receives delegations and makes pronouncements from his home town. The Republicans campaigned heavily on the issue of protective tariffs, turning out protectionist voters in the important industrial states of the North. The election focused on the swing states of New York, New Jersey, Connecticut, and Harrison's home state of Indiana. Harrison and Cleveland split these four states, with Harrison winning by means of notoriously fraudulent balloting in New York and Indiana. Voter turnout was 79.3% because of a large interest in the campaign issue, and nearly eleven million votes were cast. Although Harrison received 90,000 fewer popular votes than Cleveland, he carried the Electoral College 233 to 168. Although he had made no political bargains, his supporters had given many pledges upon his behalf. When Boss Matthew Quay of Pennsylvania, who rebuffed for a Cabinet position for his political support during the convention, heard that Harrison ascribed his narrow victory to Providence, Quay exclaimed that Harrison would never know "how close a number of men were compelled to approach...the penitentiary to make him President." Harrison was known as the Centennial President because his inauguration celebrated the centenary of the first inauguration of George Washington in 1789. Civil service reform was a prominent issue following Harrison's election. Harrison had campaigned as a supporter of the merit system, as opposed to the spoils system. Although some of the civil service had been classified under the Pendleton Act by previous administrations, Harrison spent much of his first months in office deciding on political appointments. Congress was widely divided on the issue and Harrison was reluctant to address the issue in hope of preventing the alienation of either side. The issue became a political football of the time and was immortalized in a cartoon captioned "What can I do when both parties insist on kicking?" Harrison appointed Theodore Roosevelt and Hugh Smith Thompson, both reformers, to the Civil Service Commission, but otherwise did little to further the reform cause. Harrison quickly saw the enactment of the Dependent and Disability Pension Act in 1890, a cause he had championed while in Congress. In addition to providing pensions to disabled Civil War veterans (regardless of the cause of their disability,) the Act depleted some of the troublesome federal budget surplus. Pension expenditures reached $135 million under Harrison, the largest expenditure of its kind to that point in American history, a problem exacerbated by Pension Bureau commissioner James R. Tanner's expansive interpretation of the pension laws. Start your search on Benjamin Harrison.